OK I think that we have rounded the corner. The peppers are all in and we have gotten caught up on flower planting as well- more zinnias, sunflowers, celosia as well as salvia, cosmos and dahlias. Betsy is excited about the new dahlias partly because they are a new crop for us and this is a new kind of dahlia as well. We even managed to finally get the basil in the ground and the celeriac too! 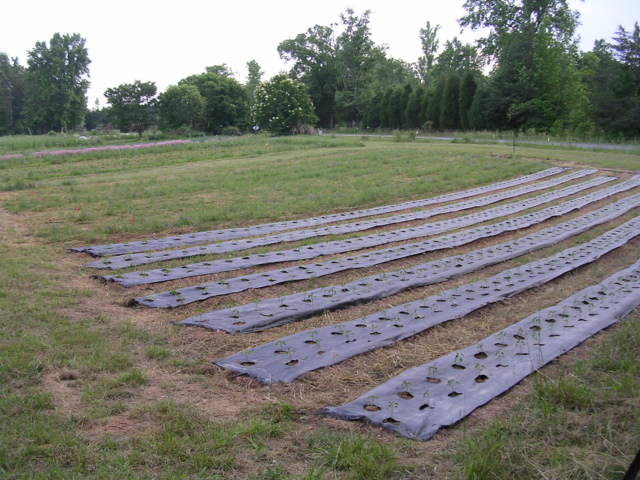 Part of the reason that the peppers are such a job (beyond the fact that there are 17 one hundred foot long beds with 2200 plants) is that almost two thirds of them we plant using system called “no-till”. The less we turn the soil over the less organic matter we lose and the better the soil micro life likes it. Every time we till the soil it’s like opening the draft on a woodstove and causes the organic matter in the soil to decompose faster. Some crops we have to till for a good seed bed but others we can just plant directly into the remnants of the huge cover crops that we have grown over the winter. In effect we grow our fertilizer and mulch right in place instead of hauling it in. We have been using this technique for nine years now and have expanded it to include the late tomatoes, winter squash and are experimenting with some of the flowers. It is a tried and true method used by corn and soybean farmers but it is very new to vegetables. The slow part for us it that we have to plant by hand into a slit that the tractor makes in the cover crop residues, sometimes the slit is better than others and it takes at least twice a long to plant as the ones that we do on landscape fabric. In the long run though not only is it better for the soil but we have found that our sweet bell peppers perform better. This week we also began a research project with some NC State grad students on beneficial insects. They are planting some tomatoes and certain cover crops down in our bottom field and will be seeing what good and bad bugs are attracted by the different crops. This is one of many projects that we have hosted over the years with NC State. It’s good for us because we are exposed to all kinds of new ideas and good for them because they get out onto real farms, which is different than doing projects on research stations. It is hard to create the kinds of crop mix and interactions that we have here back at the research station. More weeding, trellising, and lots of irrigating going on. It is really beginning to feel like a drought year at least in the way we are having to water crops, but that can change quickly. The turkeys are doing great, trying to fly around now and we have put roosting bars into the Poultry Villa now so that they have a place to fly up to and sleep on.